Ota, A., & Yamamoto, K. (2018). Disseminating a learner voice through collaborative reflection. Studies in Self-Access Learning Journal, 9(2), 234-242. 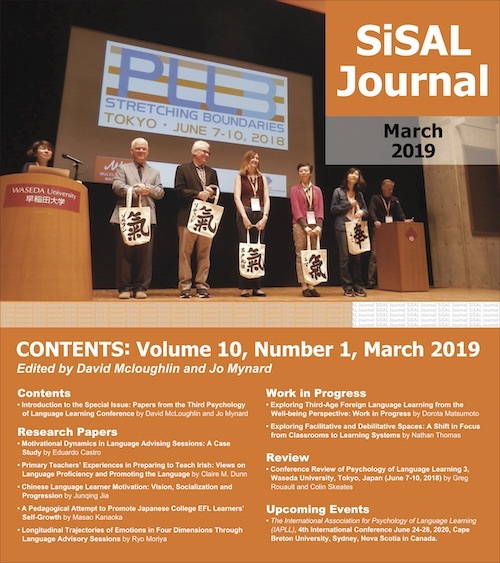 This paper reports on a series of collaborative work on weaving and disseminating a personal narrative presented at the annual conference of the Japan Association for Self-Access Learning (JASAL) in 2017. The authors of this paper, Ota and Yamamoto, have engaged in advising dialogue in the self-access learning center in their institution since 2016. After completing one year of study abroad in the United States, Ota was passionately sharing her experience with her advisor, Yamamoto, in advising sessions. Her willingness to share her voice encouraged them to showcase her journey in overcoming hardships during study abroad at JASAL 2017. Drawing on Ota’s study abroad experience, they discussed emerging themes in her written work throughout the continuous advising dialogues. Simultaneously, taking a reflexive approach, they actively shared their views and background as a crucial dimension of co-constructing Ota’s personal narrative. Reflecting on their collaborative work, the authors illuminate the active roles of self-access learning centers and the educators in empowering learners to disseminate their voice as a form of activating their agency. At the 2017 annual conference of the Japan Association for Self-Access Learning (hereafter referred to as JASAL 2017), the poster presentation named “How I have grown as a student and as a woman” was presented by a Japanese female college student, Ota and her learning advisor, Yamamoto from Kanda University of International Studies (KUIS). They have been working primarily outside the classroom in the form of advising sessions in the self-access learning center (SALC) at their institution since April 2016. In September 2016, Ota moved to the United States for a year, aiming to improve her English skills as well as build friendship in a new academic community. As other studies (e.g. Block, 2007; Chik & Benson, 2008; Morita, 2004; Norton, 2001) argue, language learning in study abroad context entails not only linguistic acquisition but also identity issues that derive from the struggles of being a minority in a different sociocultural community. Ota’s story shared in the advising sessions on her return to Japan also illustrated her meaningful experiences in the United States, including the challenges of becoming a member of the community in the English-medium classroom and the changes within herself in the process of gaining confidence as an active member of the community. Yamamoto, who had been witnessing Ota’s progress throughout a series of advising sessions, was inspired by her voice captured in her story, which lead both of them to disseminate Ota’s narrative for other learners as well as educators at JASAL 2017. The reflexive dialogue between Ota and Yamamoto became the main data source and the analytical scope in their collaborative work; in other words, beyond the given positioning as an advisee and a learning advisor, they openly shared their perspectives stemming from their sociocultural backgrounds. Thus it is the authors’ hope that this paper highlights the importance of their reflexivity in the process of making sense of Ota’s learning experience. Moreover, the advising notes from the series of advising sessions since 2016 played a crucial role in following her learning trajectory over the period of a year. The unique approach to her personal narrative enabled them to unfold her critical experiences, including the struggles with negotiating her identities within new academic community and the socialization with the significant others she encountered in the States. This paper will first detail their background including the advising context at KUIS as well as Ota and Yamamoto’s reflexivity. It will next move onto the summary of their collaborative work. Within this section, Ota’s written narrative, which became the foundational data in their work, will be presented. The paper will conclude by illuminating the value of disseminating learners’ narratives and the role of educators from sociocultural perspectives. In order to clarify the context of this study, this section provides the overview of advising support in KUIS and the researchers’ reflexivity drawing on Ota and Yamamoto’s advising history as well as their sociocultural backgrounds. Advising in language learning (ALL) has been implemented in a growing number of educational institutions, especially among self-access learning centers globally as a form of promoting autonomous language learning. Taking a learner-centered approach, learning advisors support language learners with taking charges of their own learning in various forms of dialogic interaction. Its prominence has been discussed in recent studies (Karlsson, 2012; Kato & Mynard, 2015; Carson & Mynard, 2012; Tassinari & Ciekanski, 2013; Yamashita, 2015) and the dialogues between a learning advisor and a learner become a vehicle of reflective practice on the multifaceted process of language learning, including its cognitive as well as affective dimensions. Situating the SALC as a hub of autonomous learning in the institution, a number of students in KUIS engage in this reflective dialogue with their advisors outside the classroom. On the one hand, some students work with their learning advisors primarily for linguistic as well as learning skill development. On the other hand, other students regularly schedule an appointment (e.g. weekly/bi-weekly) to talk about their everyday language learning. The topics covered in the session vary; they include not only linguistic questions but also affective issues (e.g. speaking anxiety, peer pressure in classroom), personal issues (e.g. part-time job, club activities), and future-related issues (e.g. study abroad, job-hunting, postgraduate study). Defining language learning as a social process that involves identity development (Benson & Cooker, 2013; Lamb, 2013; Norton & Toohey, 2002), the dialogue between a learner and a learning advisor often appears discursive rather than prescriptive. Thus, the role of learning advisors in ALL is multifaceted; they are not only positioned as language experts but also as supporters, listeners and significant others. Ota has been using the booked advising support since she started her study at KUIS. She was seeking advice for learning grammar effectively when she requested the first advising session with Yamamoto. While the first several sessions appeared to be more or less tutorial in style, gradually Ota started reflecting on the reason for going abroad, for her future dream, and for choosing to come to the advising space every week. “Whenever I am here (advising room), I feel like being a different person” (Ota, personal communication, n.d.). Yamamoto, who had been engaging in the advising dialogue with Ota, found these words powerful as it signaled Ota’s in-depth reflection on her sense of self beyond language acquisition. Simultaneously, it encouraged Yamamoto to continue documenting Ota’s transformation in language learning longitudinally, including her study abroad. While their positions can be distinguished as an advisee and a learning advisor, in that learning was mutual, they found several similarities between them. Growing up in Japan, they were both entirely exposed to Japanese secondary education, including the traditional grammar-translation style English teaching methodology. Although they are from different regions of Japan and different generations, their sociocultural background led them to gravitate toward sharing their own experiences in advising sessions. Indeed, Ota’s stories often reminded Yamamoto of her past self because she had also spent a year abroad when she was a college student. Drawing on their reflexivity, the ongoing dialogue between Yamamoto and Ota played a crucial role in analyzing Ota’s narrative in their collaborative work. This section will document the process of creating the poster presentation including the detail of collaborative reflection and Ota’s narrative, which will be presented in the following primary data subsection. In preparation for the presentation at JASAL 2017, Ota first started writing her study abroad experience as a first step to make a presentation. Based on her writing, she reflected on the changes and challenges within herself in the advising sessions with Yamamoto. Simultaneously, Yamamoto went over the advising notes written down in the previous sessions in order to elicit in-depth stories. The emerging themes in their dialogues were chosen as the main topics to be covered in their poster presentation. Using free time after school, they discussed the contents and design and created the posters below (Figure 1). Prior to the conference, with the support from other learning advisors, they ran through the presentation several times. In this paper, the authors decided to share Ota’s written narrative as crucial data of this study in the hope of inviting the audience to delve into the firsthand stories and make sense of what the challenges and changes meant to her growth. Her narrative starts with her struggles of negotiating her identities in the different academic communities in her new life. It then plots the critical experiences with other members of the communities that empowered her to initiate the transformation within herself. I faced a lot of challenges while studying abroad; however, the difficulties helped me to grow as a student and as a young woman. One of the biggest challenges was that I constantly compared myself with others. There were so many talented people who had overcome a number of challenging situations in my school. One of my friends, whom I met there, is from Western Sahara but was raised in a refugee camp in Northwest Algeria for more than half of her life because of political conflicts in her country. She is now a successful student at the school and has been doing a project of building a library at the refugee camp so that people in the camp can study and get an education. Looking at inspiring people like her, I got disappointed with myself; I felt like no matter how much I tried I wouldn’t even get to the starting line when other people were already at the finish line. Thinking about where I came from, I felt like having no special experience or reason to study abroad. I was not even speaking English properly at that time. Thus, I couldn’t stop comparing myself with other students. Another difficulty in my life in America was that I frequently felt I was an “outsider” on many occasions. Because my English was not fluent, I felt scared of talking to others, especially in the classroom. As I was from a collectivist country, Japan, where many people don’t usually express their opinions or counter statements while other people are talking, I got intimidated by their talk. I felt like I didn’t belong to the class and it seemed like they were talking around me. However, I wanted to prove that that was wrong and I was also learning the same things and had my own opinion. Although I faced these challenges, I tried my best to overcome those situations by accepting who I am and showing my enthusiasm to become a part of the community. During my study abroad, I met someone from Vietnam and we became close friends. We had many similarities in terms of personalities and lifestyles. Because we were taking the same English class and took the same bus, we had a lot of time to talk each other. She was really into TED Talks and introduced me to a video that got my attention immediately. It was called “the power of introverts” by Susan Cain. The content of the video really explained who I am and how I am different from other people. By openly talking about my personality with my friend from other country, I started accepting myself and becoming confident as an introvert. I gradually realized that I didn’t need to copy other people’s achievement to satisfy myself; instead, I started thinking about reaching my own goal to be successful because everyone has a different definition of being successful. This change within myself also encouraged me to show my willingness to be a part of the classroom community in school. Since the reading materials were deeply related to American history and culture which I was not familiar with, I needed to take a lot of extra time to learn them in order to do my homework. Because I was studying harder than other students, many of my classmates started noticing that I had enthusiasm towards learning new things. I also started feeling that I was the same as my classmates or a part of the community when receiving positive comments from them. My teacher also started recognizing my willingness and tried to help me pair up with other classmates. These changes made me feel less scared to ask and talk to American classmates and more comfortable being included in the classroom. In addition to the classroom experience, I had a lot of opportunities to learn about the cultural diversity in America outside the school, which allowed me to see myself as a part of the community. For example, I joined several events held by the LGBT community in my school. Being an “international student” in America, I though deeply about how it would be to be a minority in the society. This experience helped me become more open-minded. Another memorable experience was participating in a protest against the U.S. president with my host mother. This event enabled me to understand the importance of having my own voice. I also learned about women’s rights from my host mother and my writing teacher. Living in Japan, I had never thought about it deeply before. It even gave me a chance to think about the reason why we do not even talk about it. Now I am living here again, and I am facing gender inequality in various situations such as job hunting. I feel really happy to become who I want to be; now I can see what is happening around me from various perspectives. Without the challenges, I would not have been able to realize what is happening outside my own small world. I don’t see myself as a different person from who I used to be before studying abroad in the States; however, I can certainly see different dimensions within myself, who was created through interaction with others. It is like a kaleidoscope that shows different colors and shapes. In the poster presentation at JASAL 2017, Ota’s narrative received significant attention from different groups within the audience (Figure 2). The main questions from the participants included how she built relationships with others in America, how she had been dealing with reverse culture shock since she had returned to Japan and how she felt about the change within herself. Particularly, her voice empowered those who were willing to study abroad to draw their positive future selves. In her post-presentation email correspondence, she noted that “I was very happy because my experience helped them to have a big picture of what it will be like to study in another country” (Ota, personal communication, December 2017). The presentation became a good opportunity for Ota to share her experience and disseminate ideas on how the challenges helped her grow in more than just the linguistic sense. It also allowed for a personal recount of experiences that illustrated the importance of identity and voice in helping students, which proves important for those working in or involved with self-access. As illustrated in the previous section, Ota’s narrative depicted her agency beyond language learning. While the marginalization from the English academic discourse was perceived as a great challenge, she continued seeking a breakthrough by working on her weaknesses and interacting with other learners as well as teachers. Moreover, her willingness to learn empowered her to become a part of diverse communities (e.g. participating in the political protest, communicating with the LGBT community). It is important to note that her autonomous actions illustrated in her narrative were not simply derived from her innate capacity to control her learning. Indeed, she had been a self-driven student with high motivation to learn English prior to study abroad in the United States. However, her personal narrative implies that the drastically different sociocultural context urged her to re-conceptualize herself from being a highly motivated English learner to be an active participant of the English academic community. Therefore, Ota’s agency needs to be understood in relation to her identity construction in a particular sociocultural setting. In addition to the theoretical insight into Ota’s learning experience, the reflection on their collaborative work provides several implications with the professional community in the field of self-access learning. First, the opportunity to disseminate language learner’s narratives is needed as a means of inspiring and empowering other learners to pursue their aspiration for language learning. The voice of language learners could serve as a “near-peer role model” (Murphy & Arao, 2001), which potentially becomes the foundation of a community of learners who share similar investment in language learning. Moreover, situating SALCs as social learning spaces, creation of the opportunity (e.g. a social gathering, informal conference) within the spaces is crucial for the active community of learners to thrive. The teacher/advisor support should play a powerful role in encouraging the learners to share their narratives with others. Narrative is not just a storytelling for him/herself; rather it is “discursively constructed with others in particular spatiotemporal contexts” (Barkhuizen, 2011, p. 397). In other words, participating in everyday interaction with learners could generate their willingness to share their voices. Although the implications above are limited as they draw on a single case study, Ota and Yamamoto’s collaborative approach to the narrative sheds light on potential research as well as practices in the self-access learning context. This paper has presented collaborative work on disseminating the voice of a language learner who overcame various hardships in the study abroad context. Drawing on the authors’ unique relationship, they have demonstrated a reflexive approach to Ota’s personal narrative to make sense of her experiences in the new academic community. It is their hope that this paper invites readers, particularly those who are in charge of supporting language learning, to actively engage in co-constructing learners’ narratives in everyday interaction and empowering them to share their voice as a form of supporting learner agency. Airi Ota is an undergraduate student at Kanda University of International Studies. She studied hospitality, American history and gender equality at Whatcom Community College in the United States. Her research interests include advising in language learning, learner motivation and language learner identity. Kie Yamamoto is a learning advisor in the Self-Access Learning Center at Kanda University of International Studies in Chiba. She holds an M.S.Ed from Temple University Japan, and is currently pursuing an Ed.D at the University of Bath in the UK. Her research interests are language learner identity, advising discourse, and narrative analysis. Block, D. (2007). Second language identities. London, UK: Continuum. Chik, A., & Benson, P. (2008). Frequent flyer: A narrative of overseas study in English. In P. Kalaja, V. Menezes, & A. M. F. Barcelos (Eds. ), Narratives of learning and teaching EFL (pp. 155-170). London, UK: Palgrave. Karlsson, L. (2012). Sharing stories: Autobiographical narratives in advising. In J. Mynard & L. Carson (Eds. ), Advising in language learning: Dialogue, tools and context (pp. 185-204).Harlow, UK: Pearson Education. Lamb, M. (2013). The struggle to belong: Individual language learners and teachers in situated learning theory. In P. Benson & L. Cooker (Eds. ), The applied linguistic individual: Autonomy, agency and identity (pp. 32-45). Sheffield, UK: Equinox. Norton, B. (2001). Non-participation, imagined communities, and the language classroom. In M. Breen (Ed. ), Learner contributions to language learning: New directions in research (pp. 156-171). Harlow, UK: Pearson Education. Norton, B., & Toohey, K. (2002). Identity and language learning. In R. B. Kaplan (Ed. ), The Oxford handbook of applied linguistics (pp. 115–123). New York, NY: Oxford University Press.